Michael Pendergrass | Legacy Planning Partners, LLC. Mike, as he is known by most, is the President and Co-Founder of Legacy Planning Partners, LLC. 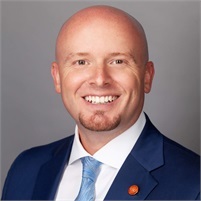 A life-long Oklahoman, he received his Bachelors of Science in Finance from Oklahoma State University in 2005 and entered the financial advisory industry the same year. Since that time he has been the recipient of multiple industry awards and accolades, most recently being awarded the 2017 National Sales Manger of The Year Award for the Career Agency System at Penn Mutual*. In addition to providing organizational leadership and oversight of firm initiatives, Mike has a passion for guiding success-minded financial advisors and clients in the development and execution of their WHY. Mike resides in Mustang, Oklahoma and is married to his high school sweetheart, Christy. Together they do their best to keep up with their two children, Emma and Corbin. * The National Sales Manager of The Year Award does not evaluate quality of service provided and is not indicative of the award winner's future performance.